Our Clun Forest sheep flock’s main job is to provide us with outstanding lamb, but they also produce an excellent fleece for a variety of yarns and other fiber uses. Each year we harvest the best lambswool fleeces and the nicest ewe fleeces to save for our handspinning customers or to have spun into yarn. The wool from our flock is prized by knitters for its robust yet soft texture. Many find our Clun Forest wool some of the most sturdy and lustrous yarn they’ve ever worked with (click here for more details). While we sell only natural colored yarn (a rich creamy white), it takes any color of dye beautifully. A steal at $14.00 a skein (4 oz), our organically spun yarn yarn is available year ’round. 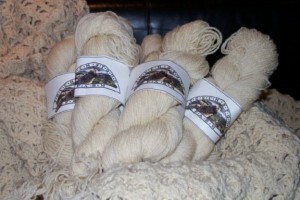 To get more information on fleeces or finished yarn, please contact us here. Yarn orders by check or credit card can be processed directly from this website via paypal. To order yarn from us, simply click the “buy now” button and we will process your order immediately. If you are local, a much easier and more pleasant way to buy is to visit Knit Wit Yarn Shop in Sperryville, VA. Another option is to visit Solitude Wool to see how our Clun Forest fleeces have been spun with other fibers and dyed in a variety of colors. Sold Out until Summer 2018! We offer fleeces to handspinners after we shear our sheep each March and sell out fairly quickly. Our fleeces average 5 inch staple with a spinning count of 54 to 58 and a micron count of 27-29. Our prices begin at $10.00 a lb. for straight Clun Forest fleeces and $15.00 a lb. for lambswool fleeces. The average weight of a Clun Forest fleece is 6-7 lbs, while a lambswool fleece will average 5 lbs. If you are interested in a well-skirted fleece right off the sheep, please click on the ‘Buy Now’ button and fill out the form and we will calculate shipping charges to your home or office. Please note that while these fleeces are clean and skirted, they are from sheep that have not been blanketed and may have some minor vegetative matter. 1 Ewe Fleece 4 lbs $40 SOLD! 4 Ewe Fleece 6 lbs $60 SOLD!